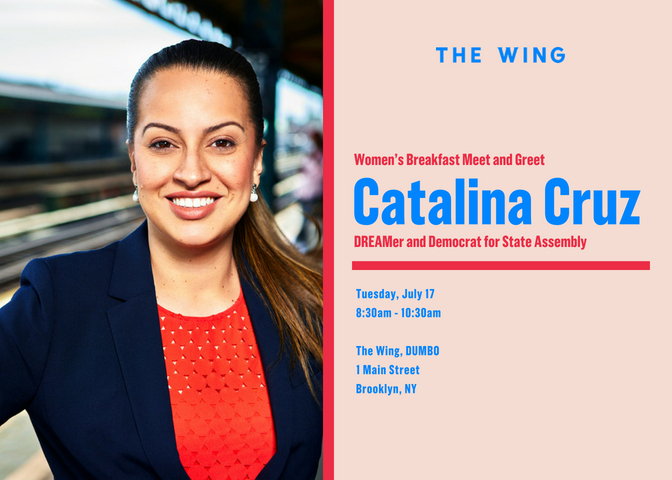 Women, come meet this historic candidate over breakfast in a beautiful environment -- at The Wing, women's social club and co-working space. Catalina’s single mother brought her to Queens at age nine from Colombia. Catalina and her mom struggled, selling empanadas on the street, cleaning offices at night, and collecting cans to make ends meet. Catalina vowed to protect immigrant and poor families like hers. She worked her way through college, then law school, becoming a citizen along the way. Catalina has spent her entire adult life advocating for her community as an attorney and leader for tenant protections, immigration reform, and workers’ rights. She’s influenced policy in the Governor’s office and as chief of staff in the City Council. As she runs for State Assembly to represent Queens 39th District, Catalina’s platform includes protecting women’s reproductive rights, investing in public education, and providing protections to immigrant families from Trump’s destructive policies. We are not helpless. THIS is how we make change and fight back. Imagine being able to say, “I helped elect the first DREAMer.” Together, we can make history. Questions: Email Dawn Siff at dawnresists@gmail.com.